Over this past week, I have mostly worked on Keiichi’s and Nobuhiko’s sprites for the prologue. A lot of them are done now, but there’s still a little bit of work left to do. I guess you can expect to see some sprite previews next Saturday, or maybe even over the course of the coming week on our Twitter. So you might want to keep an eye on that! 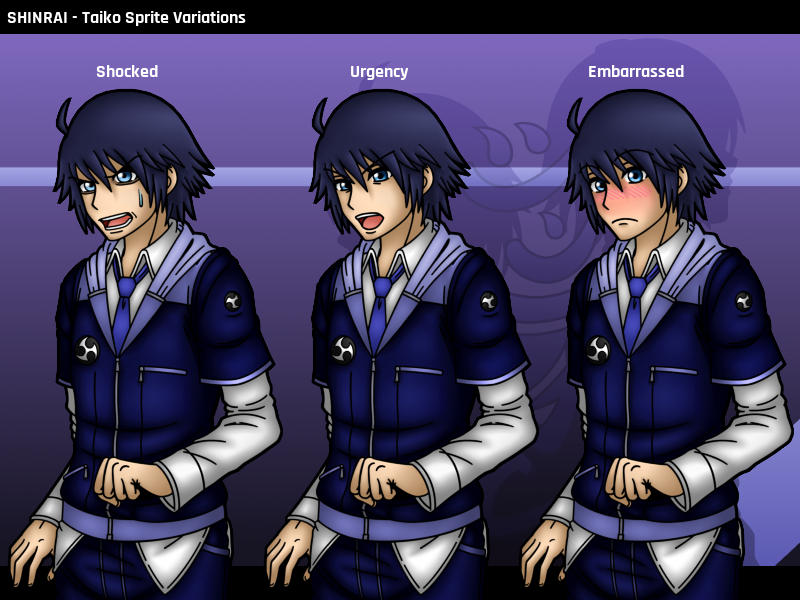 When it comes to the sprites, there’s a lot of thought going into the expressions and poses. Which expression/pose might fit the character best? How does Keiichi look when he’s shocked? How does Nobuhiko look when he’s shocked? They have drastically different personalities, so their reactions drastically differ as well. Whereas Keiichi being shocked looks a little more comical, for example, Nobuhiko’s shocked state is much more grim and serious (though it also depends on the context. In a very serious situation, Keiichi might look more serious as well). That’s the most basic thought process, but it actually goes a little deeper than that. I cannot draw completely new poses for every single expression of each individual character. Well, I mean I could, but… with the amount of characters appearing in the game, that’d take forever. So naturally, I take the same approach I did with SHINRAI. I draw a pose and re-use it for various expressions. For example, the pose I used for Taiko being shocked is the same one I used for him being in a state of embarrassment and urgency. Basically, this means that I have to take into consideration which of the many pose ideas I have might be best suited for multiple expressions. Because I simply cannot allow myself to draw too many pose variations. That would be way too much work. I realized that when I did it with Rihatsu at the beginning of SHINRAI. So yeah, I’ve been putting a lot of thought into the poses. I had to ditch some of my initial ideas, but I’m still satisfied with what I’ve come up now. I hope you’ll like them, too. I especially enjoy Keiichi’s expressions, haha. Anyway! I’ll continue the sprite work over the next few days and then finally finish the BG. Afterwards, it’ll be time for sound design. Speaking of sound, if you support us on Patreon, you can now listen to GENBA no Kizuna’s first BGM! I have just uploaded it. I also say a few things about our new composer there, so if you’re curious, please consider checking it out! Now that we actually have a new composer, Patreon has become even more important to help us cover the costs, so we would truly appreciate the support! I’ll eventually upload the track to our YouTube channel as well and make a public announcement about our new composer, but since the whole point of launching a Patreon page was to get additional funds in order to hire a composer… patrons will naturally get access to that stuff way ahead of everyone else.